This was the first day of our fall vacation to Maine. Our plan was to spend a few days hiking in Baxter State Park, then head for the coast and work our way south from there, stopping to hike and kayak where we felt like it. We arrived Thursday night to Roaring Brook Campground. Unfortunately, we were only able to reserve a leanto for the one night. All leantos and tent sites were reserved for the weekend. I had hoped we could stay at Roaring Brook for 3 nights, but it was not to be. 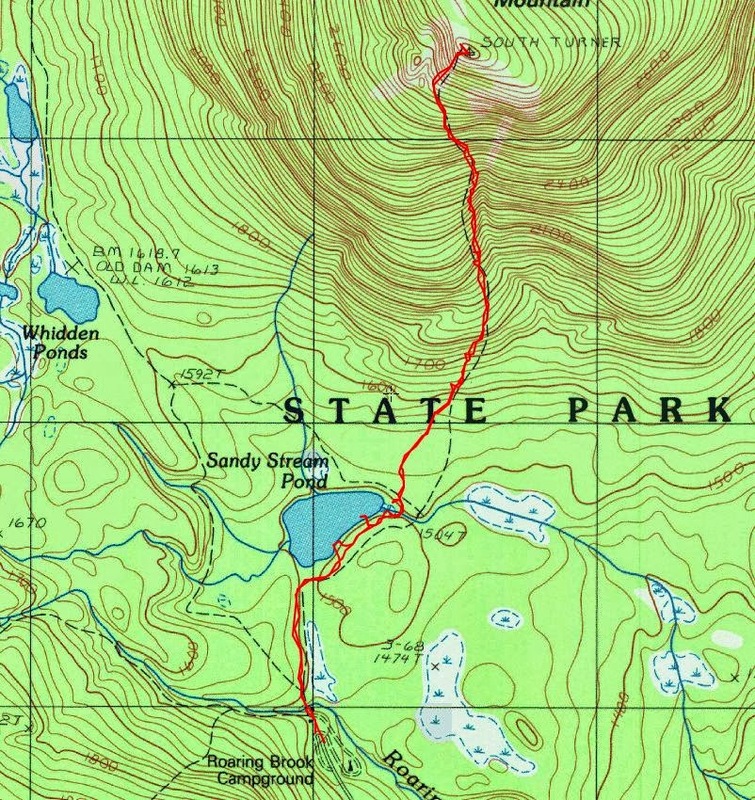 Roaring Brook is the most popular access point to Katahdin. The trail to Chimney Pond starts right at the campground. Leesa and I knew we wanted to climb Katahdin, but we wanted to wait for a perfect weather day. On this day the forecast was for patchy fog with wide spread showers and highs in the 60's. We decided to start by hiking to Sandy Stream Pond to look for moose, then climb South Turner Mountain as a 1st day warm up hike. First we had to vacate our leanto, so everything went back in the car. We had leanto 4 at Roaring Brook which faced the brook. The leantos are close together, but with the loud noise of the brook, you can't hear anybody at the adjacent leantos. When we arrived on Thursday night, rain began just as we were setting up our gear in the leanto. The morning just had drizzle and patchy fog as forecast. We didn't see any moose at Sandy Stream Pond, but we did get limited views of the mountains. The trail to South Turner stays mostly in the woods until it reaches a scree field slide 3 or 4 hundred feet below the summit. From there, it's a fun scramble to the top. We highly recommend this mountain. It provides a great view to Katahdin from the east (on a clear day), and it's less than 4 miles round trip. It's a fun climb. At the top, we sat down behind a big rock in a shelter from the wind, and ate our lunch. We returned to the car by the same path. It was then time to drive to the west end of the park and the Nesowadnehunk Campground where we had a leanto reservation for Friday and Saturday night. This campground is the farthest from the popular trailheads, but it was the only one with availability. We felt good about climbing a moderate peak on the first day, and getting to explore the park a little bit as we went from the east side to the west side.